Career Linguist – Page 54 – Careers for Linguists. Linguistics for Career. Examine your own path with an eye to identifying patterns in the choices that you make and have made. In the way that you are trained as a sociolinguist to examine presuppositions, identify underlying assumptions and (often largely unsconscious) systematicity and patterning in your own academic and professional life. When you are given the choice, what kinds of research topics, communities, and methods of analysis are you drawn to? Do you prefer field research or reading? Why? Maggie Debelius in SWAYGTDWT? talks about this as a question about whether you tend to prefer to get your information from people or from books. This point is a significant one. These tendencies may point to different choices of industry or maybe functions within those industries, or maybe even just ways that you can structure any job to carve out more of the work that you enjoy. You will probably be better at jobs you enjoy simply because you enjoy them. Professors: Think about the feedback you have gotten from your professors about what projects you have done the best on. Go back to these who you trust (as well as your friends and family) to ask some more about where they see your strengths. What type of instruction do you prefer (this can tell you something about how you function in a team or what type of supervision you want to look for / ask for). Thinking about professors who you found challenging to work with, what can you identify as being the source of your frustration? Sometimes we forget that we can really ask for the work environment that we want. When we know as much as possible about how we function, the better position we are in to navigate this conversation. Classes: Looking back on the classes you have had thus far, ask yourself what types of classes are you drawn to? When you are given freedom of type of project to create, do you choose multimedia, web-based, or service-type projects? What types of projects do you excel at? Jan Blommaert and the career search? 1. In analysing language-in-society, the focus should be on what language use means to its users. in the interview context, this means not just that the language you use matters, it is HOW the language you use matters. We need to gain as much access to the “insider’s view” of the culture that we are seeking to enter. 2. We have to be aware that language operates differently in different environments, and that in order to properly understand how language works, we need to contextualize it properly, to establish the relations between language usage and the particular purposes for which and conditions under which it operates. In other words, we need to know as much as we can able the speech event that is a job interview. 4. In interaction [people] are constrained by the range and structure of their repertoires, and the distribution of elements of the repertoires in any society is unequal. It all comes back to power. Remember Doug’s observation that the FIRST thing interactants are evaluating is status. This information tells us how any interaction will go. 5. We have to conceive of communication events as ultimately influenced by the structure of the world system. I think the way that this emerges most powerfully in the work that we are all doing in the Proseminar in our awareness that communication (what it means, what it can do) is shifting because of social media. As we go out in the world and talk about our competencies, we will be expected to have thoughts about this. 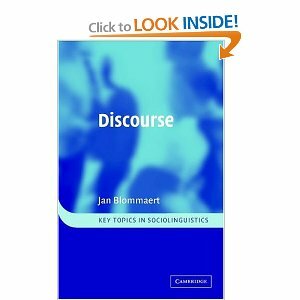 I am also really loving Blommaert’s assessment that “a critical analysis of discourse in contemporary society is an analysis of voice…or “the way in which people manage to make themselves understood or fail to do so. In doing so, they have to draw upon and deploy discursive means which they have at their disposal , and they have to use them in contexts that are specified as to conditions of use.” The reason this is important, our “so what” is that “voice is the issue that defines linguistic inequality (hence, many other forms of inequality) in contemporary society” (pp 4-5). Posted byannatrester March 30, 2011 October 19, 2014 Posted inThe job searchLeave a comment on Jan Blommaert and the career search? Tim Brown, the CEO of the “innovation and design” firm IDEO talks about the need for (and benefit of) play in creativity. He gives some great activities to catalyze an audience in a smart and fun way!! When I think about raising awareness of sociolinguistics, one of the biggest contributions I feel compelled to make is in helping people become more aware of their culture and of themselves in intercultural interactions. Hi, I am Anna Marie Trester. I am the Assistant Director of the MA in Language and Communication (MLC) at Georgetown University in the Department of Linguistics. My work here involves raising awareness of the usefulness of Sociolinguistics in today’s workplace. In my research (on improvisational theater, peace vigils, and tourism in Costa Rica), professional projects (e.g. the companion website for McNeill Lehrer’s documentary Do You Speak American? ), and teaching (this Spring I am teaching a professionalization seminar for MLC students), I bring together my academic training with past professional experiences (i.e. as an analyst at Goldman Sachs & Co). I received my M.A. in Linguistics from NYU in 2002 and Ph.D. from Georgetown in 2008.